The Radisson Resort on Denarau Island provides with 270 luxuriously appointed large hotel rooms and oversized suites. Guests can choose from either guest rooms or 1 & 2 Bedroom Suites complete with views of the gardens, lagoon or ocean and a unique Fijian blend. 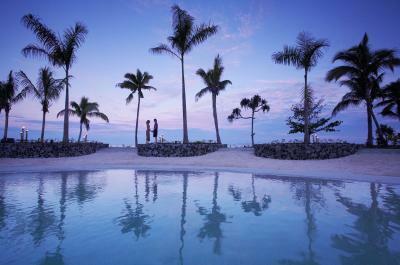 Couples, families and friends can enjoy the great beach frontage at the Radisson Resort Fiji on Denarau Island. At this amazing property you can surround yourself with the natural beauty of landscaped gardens, peaceful lagoons and cascading waterfalls. The Radisson Denarau Island Resort also has an array of activities that will entice, entertain, relax and delight everyone's senses. Guests of all ages will delight in the 5 swimming pools including large lagoon pools, jacuzzi’s, Harmony Spa Retreat, workout facilities, private adults only relaxation lagoon area - the perfect place to absorb the tranquility of the tropical setting and a dedicated children's pool with UV protection shades. When staying at the Radisson Resort on Denarau Island you can visit nearby islands and explore rainforest walks, partake in water sports, fishing, beach activities and a round of golf or just relax in the wellness spa, large lagoon pool and range of dining and entertainment options.